LONDON – For kids and adults who like to read children’s books, Philip Pullman’s “His Dark Materials” trilogy of fantasy novels are second in popularity only to the Harry Potter stories. They are rich with colorful characters with exotic names, high adventure in far-flung places, mystical creatures, bears that speak, witches that fly and parallel worlds that can be crossed into only with a magical knife. Mounting them on stage has taken every skill that the National Theatre can muster and the result is an epic production on a vast scale, comprising two 3-hour shows that may be seen on the same day or split between separate dates. The large space of the National’s Olivier Theatre is employed fully for a sequence of massively impressive sets, designed by Giles Cadle, that rise, spin and fall, going from an Oxford college to an arctic vista, from a mad scientist’s laboratory to a marvelously spooky descent of a rowboat to the land of the dead. We are in a world where humans have daemons that take animal form as opposed to the inner demons we’re used to. And daemons are not evil, far from it, although they are the target of the church, which in Pullman’s world is the chief villain. There is no mention of Catholicism but there is talk of a Pope although the papal seat is in Geneva. Its leader, the President of the Consistorial Court, oversees an outfit called the General Oblation Board, which seeks to rob children of their daemons and end their search for the “dust” of individuality, knowledge and reason. So it’s all a bit “Paradise Lost” with echoes of “The Wizard of Oz” and bits of “The Lord of the Rings” and Harry Potter thrown in. But the fate of the girl, played with great verve and at times considerable poignancy by Anna Maxwell Martin, is wholly captivating as she discovers who her parents are, grows to love a boy from a parallel world, and learns that her fate is to be a modern Eve. Despite the huge sets, which could easily overwhelm, the humans mostly come off well. Dominic Cooper is appealing as the girl’s reluctantly heroic lover, Will. 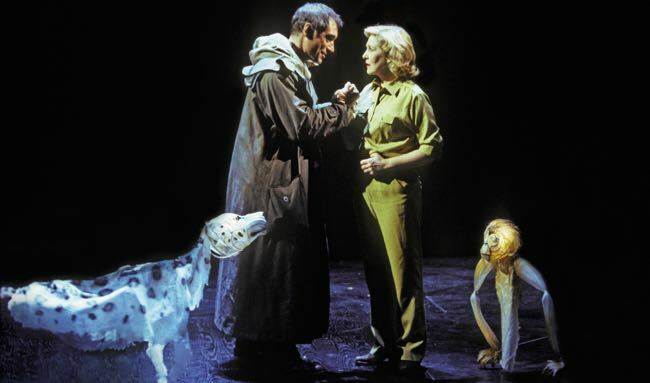 Timothy Dalton commands the stage as the reckless adventurer although Patricia Hodge (pictured above and below with Dalton), as a vassal of the church who changes sides midway, is less threatening than she might be. 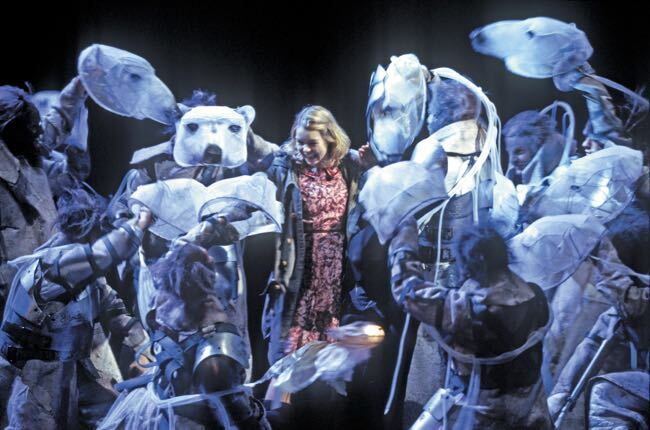 Niamh Cusack (pictured above) is radiant as Serafina Pekkala, Queen of the Lapland Witches; John Carlisle is a splendidly oily Lord; Stephen Greif employs an eerily American accent as the head of the church; Danny Sapani is magisterial as a one of a breed of armored Polar bears who has lost his armor, and Nick Sampson and Jason Thorpe have fun as a duo of camp angels. 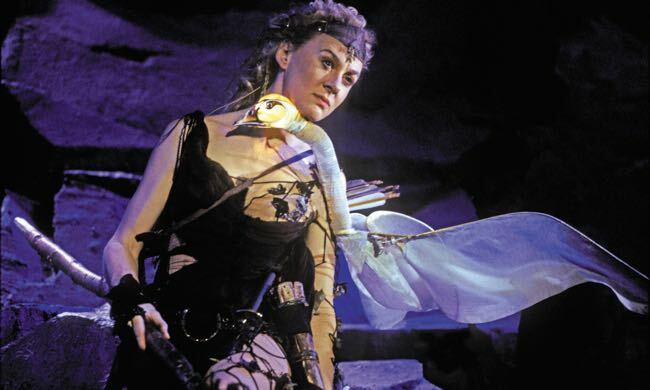 Jon Morrell’s splendid costumes, especially for the bears and a group of strikingly nasty harpies, and Michael Curry’s highly inventive puppet designs also deserve great praise. Most of the daemons are seen as animal heads with flowing cloth bodies manipulated by actors on stage dressed and masked in black. They shimmer and cavort with their eyes glowing, bringing much humor with them. There are also fully formed miniature puppets, flying and racing, with their puppeteers dark figures behind them. Brilliantly imagined and rendered, they earn some of the heartiest laughter from the audience. Despite its length and the size of its ambition, “His Dark Materials” is surprisingly easy to watch. Its epic sweep allows time for tender and funny moments, and some scenes, especially when the two young protagonists discover they are condemned to live in separate worlds, that are very moving. Pullman’s message is essentially the simple one that it’s important to live life to the full without worrying about a later reward. It’s wrapped up in vast amounts of enjoyable tosh that becomes increasingly muddled but that really doesn’t matter. When Lyra and Will have that magical knife and whole new worlds beckon, the fun of it will do very nicely. Venue: National Theatre, runs through March 27 and will return next winter; Cast: Anna Maxwell Martin, Samuel Barnett, Dominic Cooper, Timothy Dalton, Emily Mytton, Nick Sampson, Patricia Hodge, Ben Wright, Tim McMullan, Patrick Godfrey, Russell Tovey, John Carlisle, Danny Sapani, Stephen Greif, Niamh Cusack, Cecilia Noble, Chris Larkin, Nick Sampson, Jason Thorpe; Based on the novels by Philip Pullman, adapted by Nicholas Wright; Director: Nicholas Hytner; Set designer: Giles Cadle; Costume designer: Jon Morrell; Puppet designer: Michael Curry; Lighting designer: Paule Constable; Choreographer/Assoc. director: Aletta Collins; Music: Jonathan Dove; Music director: Steven Edis; Fight director: Terry King; Sound designer: Paul Groothuis. This review appeared in The Hollywood Reporter. Photos by Ivan Kyncl. 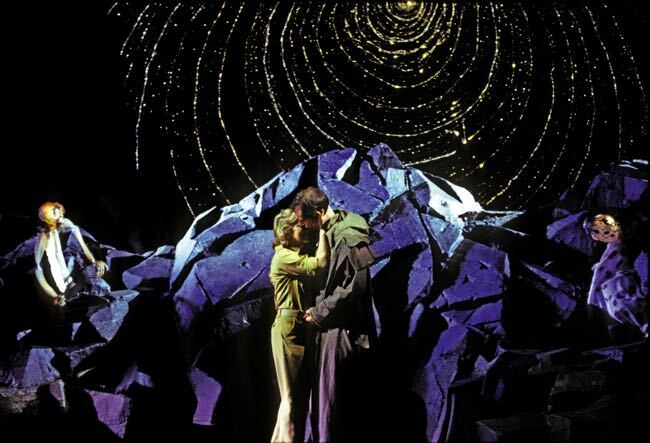 This entry was posted in Reviews, Theatre and tagged 'His Dark Materials', Anna Maxwell Martin, Ben Wright, Dominic Cooper, National Theatre, Niamh Cusack, Nicholas Hytner, Nicholas Wright, Patricia Hodge, Philip Pullman, Russell Tovey, Samuel Barnett, Tim McMullan, Timothy Dalton. Bookmark the permalink.